Hello everyone! Winter is unfortunately getting very close up here in the north, and I am clinging to all things summer for as long as I possible can! And with that, I have created a card using the Summer Blooms rubber stamp. I have heat embossed with Detail White embossing powder and water-colored this image using the Shades Ink Cube dye ink in Valentine, Royal, and Envy, and included die cuts using the Fancy Leaf die. Don't forget to come and join us for TWO monthly challenges: the Anything Goes challenge begins every first Sunday of the month, and the Anything But A Card challenge begins every third Sunday of the month! Come and have some fun and maybe even win a prize! Oh this is so stunning! Your flowers are amazing and love that fancy frame. What a gorgeous card. Wonderful design, beautiful coloring and I love the blue shading around the image. 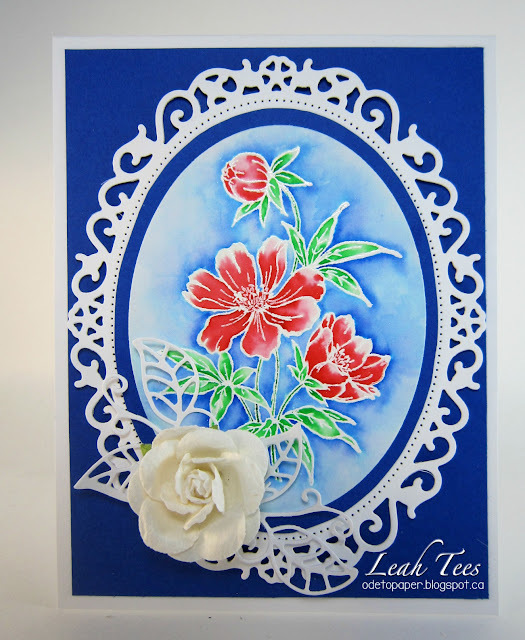 Gorgeous card design! Fabulous job on the coloring!